Lanzarotethe most original of the Canary Islands. Lanzarote is the most unusual and original of the Canary Islands. Repeated and prolonged volcanic eruptions have, until recently, influenced the fascinating landscape, which finds almost no comparison throughout the world. Lanzarote is the easternmost island in the Spanish Canaries, distinguishable by its striking volcanic surface. Almost ninety volcanoes with about three hundred craters dominate the landscape. With an area of ​​approximately 800 square kilometres, Lanzarote is the fourth largest, and therefore the middle-sized, of the seven well-known, permanently inhabited islands of this archipelago. 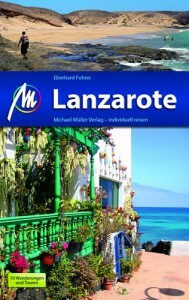 Anyone wanting to get the most out of Lanzarote, should embrace the island’s completely different and unusual nature. No forests and few trees thrive in the stony steppe-like “desert”. Nevertheless, plant life abounds everywhere: for example, bright green euphorbias cover the lava fields in the north for miles, ankle-height, colourful succulents (water-storing plants) and lush cacti proliferate, colourful flowers, palms and dragon trees adorn more than the many hotels and apartments. Objects by the famous island artist Cesar Manrique make welcome landmarks throughout various points of Lanzarote. With much dedication and love, he actively influenced the appearance of “his” island. Hardly anyone was as connected to his home as he was. It’s due to him that Lanzarote’s natural beauty has not been engulfed with mass tourism, but was elevated by the harmonious combination of art and nature. His basic idea, to make Lanzarote one of the most beautiful places on earth, is reflected in all his works, making Manrique virtually immortal. Of all the Canary Islands, Lanzarote has had it particularly hard because the island has no groundwater, a large part of agricultural regions were buried under several meters of volcanic eruptions, and the island suffered raids by pirates and slave traders, droughts, plagues of locusts, and economic crises. But the islanders’ ingenuity and tenacity have overcome disasters time and again. 1993 was a big year for the small island: the island’s particular model of development, which combines sustainable economic growth with the protection and conservation of the natural environment, brought Lanzarote the recognition by UNESCO as a Biosphere Reserve on October 7th, 1993. This was the definitive confirmation of the Lanzaroteños’ long and intensive efforts to keep one of their characteristic traits, namely the continued interest in preserving their environment. This was the first time that an entire island received this special award. It is awarded to habitats in which people and nature always live in harmony with each other, and in which the “particular requirements for careful further development” are met. The perfect symbiosis between man and nature, which was achieved in Lanzarote, is undoubtedly the main reason for this international recognition. The preservation of these properties will be one of Lanzarote’s greatest future tasks. Every year,­ more­ than­ 250,000­ Germans­ visit­ this­ north eastern Ca­na­ry ­Isla­nd, which is world-famous for its fascinating volcanic landscapes. It was classified by UNESCO as a “world­ heritage area­ of bio­sphe­res” as­ early as 1993. Its main attractions include the great ­”Fi­re ­Moun­tains”, which were ­formed­ by ­gre­at ­mag­ma ­er­upt­ions, and the underground­ caverns ­and ­tunnels­ that were formed by lava. But Lanzarote also has kilometres ­of ­black, white, and gold­ san­dy­ beaches­ that have lots to offer for water sports enthusiasts. Since tou­ris­m came to ­the island relatively ­late, ­the typical Spanish construction­s ­have been­ kept ­und­er ­control. César Man­ri­que, the island’s most fa­mou­s­ artist, ­in­flu­enced­ the ­architecture, ­until­ his­ death ­in ­an ­acci­dent­ in 1993. He designed holiday resorts closely following the tra­di­tio­nal ­construction­ methods­ of­ the­ islands.